A University of Pennsylvania paleontologist has described a 5.5 million-year-old fossil species of turtle from eastern Tennessee. It represents a new species of the genus Trachemys, commonly known as sliders, which are frequently kept as pets today. Steven Jasinski, author of the new study, is a doctoral student at the University of Pennsylvania and acting curator of paleontology and geology at the State Museum of Pennsylvania. He is completing his Ph.D. at Penn under Peter Dodson, a professor of paleontology in the Department of Earth and Environmental Science in the School of Arts and Sciences and a professor of anatomy in the School of Veterinary Medicine. The study investigated a fossil turtle found around the Miocene-Pliocene boundary in the Gray Fossil Site, an area rich with fossils in eastern Tennessee near East Tennessee State University, where Jasinski completed his master's degree. The site represents an ancient sinkhole surrounded by a forest from which dozens of fossil animal species have been characterized, including new species of red panda, Eurasian badger, kinosternid turtle, and colubrid snake. Thorough examination of the dozens of turtle fossils from the site revealed important differences between this turtle and other known fossil and living species. Jasinski named the fossil turtle Trachemys haugrudi, after Shawn Haugrud, the lab and field manager and lead preparer at the Gray Fossil Site. "Shawn has spent an incredible number of hours working on these specimens," Jasinski said. "He cleaned and prepared the fossils and was able to essentially glue this turtle back to life, giving me numerous nearly complete turtle shells to use in this research. Without all that time and effort, I wouldn't have been able to determine nearly as much about this turtle as I did. "Shawn also didn't do this work alone, as numerous other people including volunteers worked on these fossils and got them prepared so that I could complete my research. They really did all the hard work, and I was then able to determine why it was new and what its implications are" he said. Turtles are best known for their shells, and indeed it is this feature of their anatomy that is commonly found as fossils. Yet the fossil shells are typically found in broken pieces. Often gaps or holes remain, or only single small pieces are found, and the whole must be inferred from other information, including other fossil and living creatures. "It is extremely rare to get more complete fossils," Jasinski said, "but Trachemys haugrudi, commonly called Haugrud's slider turtle, provides me with dozens of shells, and several are nearly complete." Haugrud's slider turtle was a fairly small turtle, not more than approximately 10 inches (25 cm) in total shell length, smaller than the modern-day red-eared slider turtle, Trachemys scripta elegans. Red-eared slider turtles are commonly purchased as pets, though they can grow large, and some owners release them into the wild. As a result, though native to the southeastern United States, red-eared sliders have become one of the most invasive animal species in the world today, found on every continent except Antarctica. "People tend to see all turtles as similar and release them into whatever pond or river is close by when they no longer want to care for them," Jasinski said. "Once released, however, they often outcompete native species. It is a problem that scientists are still dealing with." As part of the study, Jasinski sought to determine where Trachemys haugrudi was positioned in the evolution of similar turtles both within the genus and in related genera. He performed a phylogenetic analysis, a method that compares shapes and features of different species to determine how similar or dissimilar and therefore how closely related they may be. He found Haugrud's to be most closely related to a group of fossil Trachemys turtles from Florida and next most closely related to a distinct group of fossil Trachemys from the midwestern U.S. Together, these fossil Trachemys form a closely related group situated within other still-living species of Trachemys. Today, distinct, closely-related groups of Trachemys species dwell in Mexico, Central and South America, and the Caribbean. Jasinski's investigation, along with other information from previous studies, indicates that one group evolved in Mexico and Central and South America and evolved into different species within this geographic area, and another group evolved separately in the Caribbean. 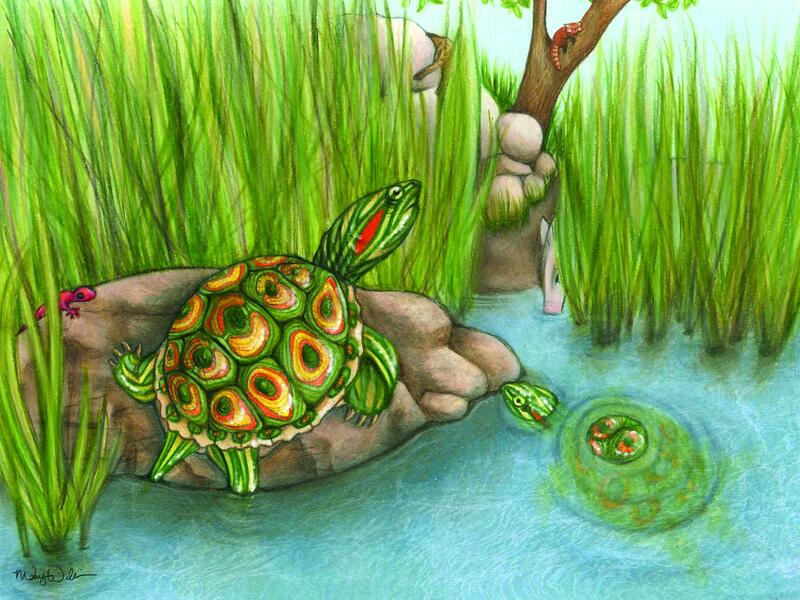 Species from the U.S., including the red-eared slider turtle, are found near the base of their "branch" of the Trachemys family tree; their fossil ancestors are still waiting to be discovered. The fossil Trachemys species in Jasinski's analysis are on a distinct part of the Trachemys tree, and current understanding suggests that they did not give rise to the modern species living today. The findings imply that there was once much greater diversity in Trachemys turtles than exists today. It seems that many of the ancient slider species died out without leaving any direct descendents, perhaps because they lacked the ability to adapt to different environments. "While Trachemys turtle species are considered plastic, implying they can adapt to and live in many environments, this adaptive lifestyle may be a relatively newer characteristic of these turtles," Jasinski said. "More fossils are needed to better understand if this aspect of their evolution is a recent addition." To get a handle on invasive turtles, understanding more about their ancient relatives could only be helpful, Jasinski said. "Trachemys haugrudi helps provide more information on Trachemys and begins to offer us insights into the evolution of an animal that has become a problematic invader in many areas of the world," he said. "Understanding how something evolved into its present form may help us understand why an animal is so adaptive and good at invading new areas and outcompeting native species. If we can see that Trachemys today are especially adaptive because evolution has allowed them to become more generalized through time, we can use that information to determine where they may invade, what species they may outcompete and what we can do to counteract those invasions or help native species compete against them." Jasinski is undertaking further study into the fossil species of not only Trachemys but other turtles within the family Emydidae, which includes Trachemys. He hopes that further data and fossils will help shed light on other turtle species and provide a clearer understanding of the evolution of this group of mainly New World turtles. The study was supported by the National Science Foundation (Grant 0958985 to Steven Wallace and the Gray Fossil Site), Office of Research and Sponsored Programs at East Tennessee State University, Don Sundquist Center of Excellence in Paleontology, State Museum of Pennsylvania, and Department of Earth and Environmental Science at the University of Pennsylvania.